Walter Cronkite stepped down as anchor and managing editor of the "CBS Evening News." Yet Americans continue to hold him in such high esteem (he has been repeatedly listed in surveys as being "the most trusted man in America") that his long-awaited autobiography, "A Reporter's Life," debuted at the Number One position on the bestseller list. Perhaps that's because, unlike TV's current crop of blank-faced glamour-newsies, Cronkite is from the old school: hard-bitten, cool under pressure, reliable - of the Edward R. Murrow tradition - a real journalist with an uncompromising sense of fair play. A man of sage wisdom and genial authority, simply put, we miss him on the air. Born in St. Joseph, Missouri on November 4, 1916, the only child of a dentist, young Walter began his foray into media work by selling newspapers and magazines as a boy in Kansas City, thus inspiring, he re-calls, "a future passion for current events, history in the making, the stuff of journalism." While enrolled at the University of Texas he became a campus correspondent for the Houston Post, and got his first job in broadcasting doing sports announcing in Oklahoma City. But Cronkite's illustrious career really began when he became a World War ii correspondent for United Press. He covered the battle of the North Atlantic in 1942, landed with the invading Allied troops in North Africa, and took part in Normandy beachhead assaults in 1944. After reporting the German surrender, Cronkite remained in Europe, covered the Nuremberg trials, and then served as Moscow bureau chief. Returning home in 1948, he became the Washington correspondent for a string of Mid-west radio stations. He joined CBS news in July 1950. During his three decades with that network, Cronkite interviewed scores of world leaders, reported on epic events from around the globe - like coronations, summits, assassinations, Vietnam and Watergate - and hosted a series of award-winning documentaries on social issues of the day. He became an acknowledged expert on America's space program. His last regularly-scheduled assignment was for CBS radio's 90-second series "Walter Cronkite's 20th Century," which ran for five years. A "this day in history"-type of broadcast, it went off the air in 1992. Along with his son, Chip, and Jonathan Ward, Cronkite formed a production company that's been churning out public affairs and cultural programs for PBS, syndication, and the Discovery channel. Walter also hosts broadcasts of the Vienna Philharmonic concerts each New Year's. The abiding quality that has apparently made him so successful has been his great curiosity. Sometimes, however, this has lead him into dangerous territory. He once watched his own appendicitis operation by opting to have the doctor give him a spinal instead of a general anesthetic, then began going into shock when an inattentive anesthesiologist failed to monitor him properly.While he projected a public image as the affable, pipe-smoking Uncle Walter, Cronkite had a reputation among his subordinates of being a very tough and demanding taskmaster, with an earnest desire to be fair and balanced in how he presented the news. He remained unfazed by the powerful. After taping an interview with then-Sen. John Kennedy, the candidate for President tried to get Cronkite to re-do the show because he wasn't happy with his awkward answers. But Cronkite stood his ground, heatedly accusing the vainglorious Senator of "unsportsmanlike" conduct. Kennedy backed down. Of course, Cronkite has had his detractors. One St. Louis Park man was so incensed by Cronkite's pronunciation of February as "Feb-yoo-ary," instead of "Feb-roo-ary" that he launched the Save Our Tongue Society, an informal group whose members point out their pet peeve grammatical mistakes. But few people would deny that the avuncular Cronkite was a calm and reassuring presence on TV, an unflappable oracle of the world's major events. One reviewer for the Los Angeles Times commented that "the very look of Walter Cronkite and the sound of his voice impart the wisdom and credibility of a modern Moses leading his flock from a wasteland of ignorance to a promised land of enlightenment." But for all his serious, on-air work, Walter Cronkite could also be a bit of a prankster. Covering a space launch outdoors at Cape Canaveral one time, he momentarily got trapped in a port-a-john when the door jammed during a commercial break, and barely made it back on camera in time. In a mischievous mood, he had a sign painted and affixed to the troublesome door of the outhouse saying: "For Use by David Brinkley Only." Described as "America's anchorman emeritus and icon of trust," the 80-year-old Cronkite still turns up from time to time on the airwaves, whether it be appearing on an episode of "Murphy Brown," or being the guest of honor at an impromptu birthday party thrown for him by Rosie O'Donnell on her show. At times this adulation can be embarrassing. For instance, Walter Cronkite drew more applause than President Clinton did when he was introduced at ceremonies honoring the 50th anniversary of d-day on the beaches of Normandy. Remembering him as a war correspondent for United Press, Edward Obert, 69, of Milford, Conn., a private in a tank battalion, remarked, "Cronkite was with us. He understood." Even Bill Clinton acknowledged that he was in awe of sharing the same stage with Walter Cronkite. Indeed, Presidents have often taken him into their confidence, as Cronkite sometimes spent private moments sharing a drink with them in the back rooms of the White House, listening, for in-stance, to LBJ pour out his heart, and enjoying the conviviality of Reagan and his circle of men friends swapping ribald jokes over champagne and cake. He's travelled in elite circles, whether it be enjoying tennis with Ethel Kennedy on Martha's Vineyard, or listening like he did once as Jacqueline Kennedy confided an intimate account of the late President's first night with her in the White House. This is not to suggest that all of Walter Cronkite's endeavors have garnered him high praise and peer respect. The Columbia Journalism Review reported that in 1989, Cronkite came under attack for accepting $25,000 from the chemical industry-sponsored American Council on Science and Health (ACSH) and narrating a pro-pesticide documentary, "Big Fears, Little Risks," which aired on PBS stations. In the documentary, Cronkite pooh-poohed consumer fears of pesticides as "chemophobia," and added some ridicule of his own, asking: "Can we find ourselves placing a hazardous warning label on every salt shaker in America?" The Review noted that the documentary was indirectly funded by pesticide makers Dow and Monsanto. If this was a lapse in his usually high standards, it was a very rare one. Walter Cronkite has spent a lifetime resisting the influence of powerful entities and maintaining an outspoken independence. In that respect, he certainly takes after his late mother, who was another independent spirit. Walter's mother, Helen, died in 1993 at the age of 101. Well into her '90s, Mrs. Cronkite was said to have dated like a schoolgirl and danced her way to happiness. Once, Walter called to ask how she was, and she replied, "Oh, I had the best time dancing last night. But I had to keep slapping my date." Dumb struck, Walter asked, "Was he getting fresh?" "Oh, no," Helen Cronkite said, "he's old. He kept passing out; I had to keep reviving him." Walter's outspokenness extends to some surprisingly frank, even bitter remarks he has made in recent months about what he regards as a failure by CBS to hold up its end of the bargain in terms of his post-retirement, on-air work. Which lately has been nonexistent. He even allows with a boyish embarrassment as to how some colleagues greet him with chilly silence when he visits the newsroom. Insiders say that "Evening News" successor Dan Rather was very uneasy with Cronkite's presence after taking over the news and, at times, consciously froze him out of air time when they shared the set, particularly on convention and election coverage. "Thank God cable's out there today to fill a hole that has been created in the broadcast network area," Cronkite comments sardonically. Maintaining a schedule that would exhaust a man half his age, Walter Cronkite is still an avid sailor who spends some days looking at his 48-foot yacht, Wyntje, from his attic office, "where ten file drawers are overflowing with papers and scripts, and the fax machine is going all of the time," he says. Even while recovering from six-hour knee-replacement surgery last year, Cronkite worked at home to complete two television retrospective on his life - one an eight-part series for the Discovery channel, the other a two-hour special for CBS, which aired last Fall. 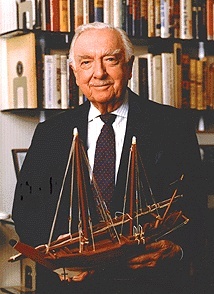 In retirement Walter Cronkite has also taught a class on ethics in journalism at the University of Texas, in the senior fellows interdisciplinary program for students with high academic and writing skills. Arizona State named their communications school after him. Over the years he's won scores of honorary degrees, a Peabody, Emmys - accolades sufficient to fill his seven-page biography, with some omitted. Still, Walter's Midwest sense of modesty prevails. Longtime assistant Marlene Adler describes him as "the easiest guy in the world to work for." He is a man, in his own words, whose "softheartedness knows no rational bounds," and who always has had "great problems at the theater, tearing up at the slightest offense against animals and people, notably the very old or the very young." But there are also signs that he has a blustery temper. Walter and his wife of 56 years, Betsy, have three children, and four grandchildren. Cronkite retains a powerful and authoritative-sounding voice. A couple of times, when he sensed a question was straying off-topic, like the old news hound he is, he politely but firmly redirected his younger colleague into more fruitful territory. Looking back on an illustrious career, Cronkite reflected, "I've been lucky enough to live through the birth of several eras, any one of which could be an age of man: the space age, the computer age, the nuclear age, the petrochemical age, the telecommunications age, the DNA age. It's been incredible. I feel fortunate to have covered these eras and to still be covering them." Contents copyright 1995, 1996, 1997, 1998 and 1999. All rights reserved.